The global urology surgical instruments market is expected to reach USD 11.48 Billion by 2021 from USD 7.74 Billion in 2016, growing at a CAGR of 8.2% from 2016 to 2021. The growth of the overall urology surgical instruments market can be contributed to rising prevalence of kidney diseases and urinary tract infections; rising number of hospitals and growing hospital investments in surgical infrastructure; availability of investments, funds, and grants from government bodies; and rising geriatric population. However, High cost of urology endoscopes and endovision systems, and unfavorable healthcare reforms in the U.S. is expected to restrain the growth of this market to a certain extent. Moreover, the growing healthcare market in emerging economies, and increasing number of free-trade agreements are expected to provide growth opportunities for players operating in this market. In this report, the urology surgical instruments market has been segmented on the basis of product, and application. On the basis of product, the urology surgical instruments market is categorized into urology endoscopes, endovision systems, peripheral instruments, and consumables and accessories. The consumables and accessories segment is expected to account for the largest share of the urology surgical instruments market in 2016. Increasing surgical intervention for urology conditions, advancements in minimally invasive surgeries, increasing prevalence of chronic kidney disorders that can lead to increase in kidney transplants, increase in awareness of urology conditions at early stages, and rising geriatric population are factors contributing to the large share of this segment. The urology endoscopes segments described in the report include laparoscopes, ureteroscopes, nephroscopes, resectoscopes, and cystoscopes. The endovision systems segments described in the report include endoscopic light sources, endoscopic cameras, wireless monitors and displays, and camera heads. The peripheral instruments segments described in the report include insufflators and endoscopy fluid management systems. The consumables and accessories segments described in the report include guidewires, stone baskets/retrieval devices, and extractors, catheters, stents, biopsy devices (valves/gun/needle), fluid flushing devices, connecting tubes, clamps, overtubes, and distal attachments, dilator sets, and ureteral access sheaths, drainage bags, surgical dissectors, needles forceps and needle holders, and others (snares, and cleaning brushes). The application segments described in the report are segmented into chronic kidney disease (CKD), urinary stones, benign prostatic hyperplasia (BPH), urinary incontinence (UI) and pelvic organ prolapse (POP), oncology, and other applications (erectile dysfunction and hernia). In the coming years, North America is expected to account for the largest share of the urology surgical instruments market. Factors such as the favorable reimbursement scenario and government initiatives to combat prostate cancer in the U.S., investments by hospitals to upgrade surgical/operating rooms and purchase new urology surgical equipment, and increase in the number of ambulatory surgical centers (ASCs) in the U.S., high incidence rate of urological cancer and the new funding model for Canadian hospitals are contributing to the large share of the North American region. However, the Asia-Pacific region is expected to grow at the highest CAGR during the forecast period (2016-2021). The high growth of this region can be attributed to favorable prospects for the growth of the urology surgical instruments market, growing healthcare industry in Japan, government investments to improve the medical infrastructure, penetration of key players in the Chinese market, growing preference for minimally invasive surgeries & improving healthcare infrastructure, German-Asian partnerships stimulating market growth, Asian countries leading medical tourism destinations, growing number of hospitals in Singapore and South Korea, and favorable healthcare system in Australia are expected to propel the urology surgical instruments market in the Asia-Pacific region. 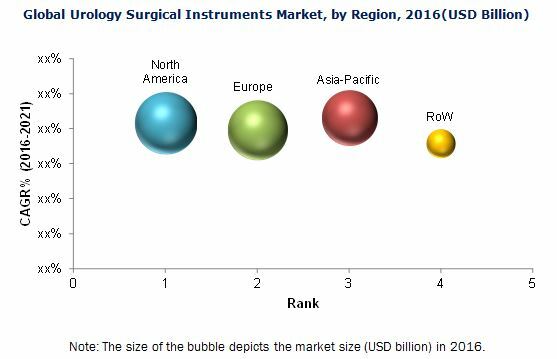 Major players in the urology surgical instruments market include Olympus Corporation (Japan), KARL STORZ GmbH & Co. KG (Germany), Richard WOLF GmbH (Germany), Coloplast A/S (Denmark), Cook Medical Inc. (U.S.), Boston Scientific Corporation (U.S.), Medtronic plc (Ireland), Teleflex incorporated (U.S.), Stryker Corporation (U.S.), CooperSurgical, Inc. (U.S.), and ConMed Corporation (U.S.).